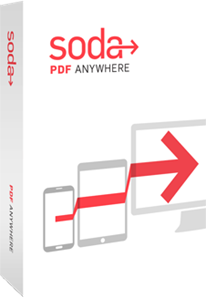 Soda PDF 9 is a fully-functional Web application to edit PDF documents on any device including desktop, smartphone, tablet etc. Its flexibility supports to literally work from anywhere using any device to create, edit, convert, review etc., of the PDF documents. It works on the desktop versions of Windows and as a reader for Mac OS X and on any device providing full compatibility with Adobe Acrobat PDF files. The Home Page provides you with how to use the software by providing dedicated options for User Guide, Product Tour, YouTube tutorials, LinkedIn and Facebook connect along with Soda PDF Online option. With the help of these you can easily navigate and know how to use the software for your needs. 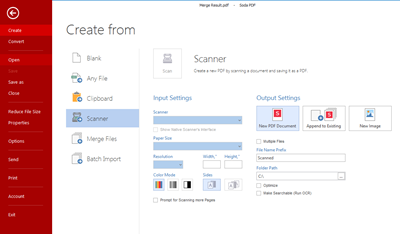 PDFs can be created from a blank page, Word, image, Excel, directly from scanner or from the Print menu of any app. Multiple PDFs can be created at once using Batch Import option. 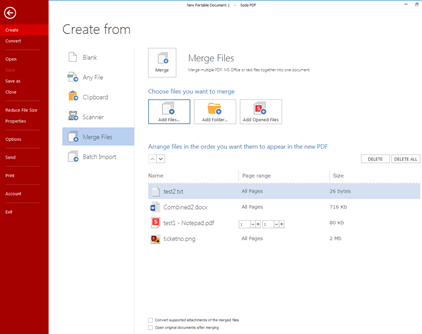 Soda PDF 9’s Merge Files option gives you lot more features where you can add different files from your desktop or any device, add a complete folder by saving you time and add opened files in the browser to merge into a single PDF document. The other beautiful feature that it supports is you can arrange the files in any order that you want them in the new PDF that you are creating. You can delete the files that you do not wish to have in your PDF and you can delete all the files also and start creating your list freshly. It allows you to convert the supported attachments of the merged files and open the original documents too after merging. The PDF files to be merged can be merged by selecting a page range or whole document. The whole feature would be complete if drag and drop files option is also given to choose the files to be merged. The date in the merged PDF file is accurate and the speed of execution is good but the merged PDF files carry the same page numbers as the original files. Soda PDF 9 supports major input file format types like MS Word Document formats like docx / doc/ rtf, MS Power Point Presentation formats like pptx/ ppt, HTML formats like html/ htm, PDF Files format like pdf/ wwf, Image formats like png / jpg / jpeg/ bmp / gif/ tif/ tiff, Comic Book formats like cbr / cbz, ePub file formats like ePub and other formats like xlsx/ xls / txt / pub. The View options are very good allowing the users to open and view PDF files and digital books in 3D using their unique page-flipping technology giving you the feel of reading a book in your hand. You can navigate, rotate, search, bookmark, snapshot your pages. You can view the pages by their actual size, fit to the width of the window, fit to the page and full screen. You can work on two different documents with their side by side view option on the same screen. You can read comic book files and ePub files like cbr / cbz. Options to open new documents in new windows or open multiple tabs in the same window are also provided along with zoom in and zoom out. You can edit PDFs in Soda PDF 9 just like editing a Word document. Font style, type and size can be changed. You can move, delete, rotate, replace and extract pages. PDFs can be split into multiple documents and Images can be extracted from PDFs. The background colors or images can be set to a current page or multiple pages or range of pages. Measurement tools like ruler and grid can also be used along with adjusting sizes and margins. 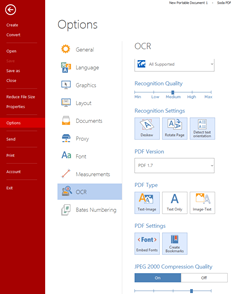 Scanned documents, PDFs or images can be turned into fully editable files with OCR (Optical Character Recognition) feature. Entire document or a page range can be converted into editable documents. Text can be automatically recognized from the pages and from within images too. Using this software up to 8 languages can be recognized. Batch recognition of texts within the images of several documents. 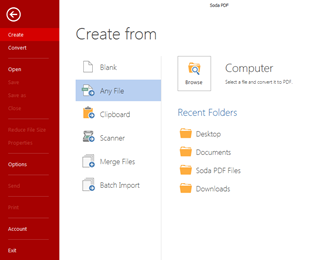 Soda PDF 9 pro version supports output formats options like Word, Power Point, Excel, Image, HTML, TXT, RTF and standard ISO format PDF/A for long-term archiving. The scanned files can directly be converted into new PDF document or append to existing an PDF files or can be converted into a new image. 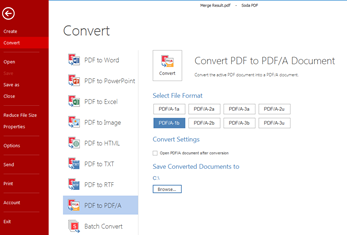 The Convert feature allows you to convert the PDF file into Word, PowerPoint, Excel, Image, HTML, TXT, RTF and PDF/A formats. The Batch Convert option allows you to convert multiple PDF files simultaneously into various formats where you can arrange the order of your files and even select page range of your choice to be present in the new document. “Search and Redact” option allows to search confidential and sensitive text and redact that text from the document. You can create signature appearance, legally binding digital certificates for authenticity and sign the documents digitally. You can co-sign a digitally signed PDF and modify document by removing a signature. Watermarks can also be added to the background of the document. 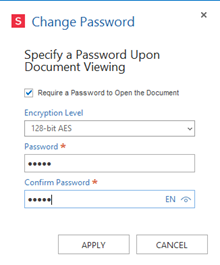 Document access restriction can be enabled by applying password setting and permission levels can be set and controlled by enabling additional security settings for creating, inserting, deleting and rotate pages, filling in form fields and signing, extracting, commenting and signing existing signature fields. Files can be accessed from Cloud storage like Dropbox, OneDrive, Google Drive, Box and from anywhere on your computer to convert/edit PDFs. 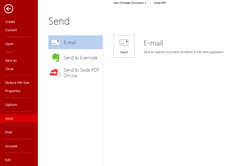 You can share the PDFs by E-mail, Evernote or to Soda PDF Online. The products are divided into Soda PDF Home, Soda PDF Premium limiting its functionality per the packages priced at $79 and $129 yearly. A 30-Day free trial is given for Business licenses and quote can be requested. A good number of discounts are provided for more 5 or more licenses. All major credit cards are accepted. A free trial version for 14 days is allowed for Soda PDF Home where there is a functional limitation. A 100% money back is guaranteed until 30 days if you are not satisfied with the product performance. The dedicated Product Tour and User Guide options on the Help tab offers a lot of guidance for users who are new to the software usage. They provide free technical customer service support by opening a ticket through E-mail. A Big Reporting facility is also provided. software runs on the operating systems like Windows 7, Windows 8 and Windows 10. It is Citrix Ready certified. There is no clarity on the system requirements on the sites web pages. 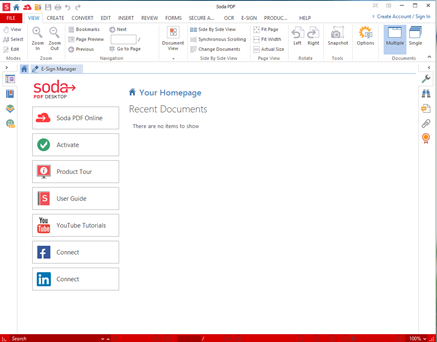 There is a new feature called Soda PDF Online where all the features of Soda PDF can be accessed through web browsers, on any device. You can use it on any tablet, smartphone or any computer by logging into your online account to access the features on the go. It is a fully functional online PDF solution where you can read, convert, review & annotate and create PDFs by connecting to Cloud storage like Dropbox, OneDrive, Box, Google Drive or access from anywhere. The mobility to use this software on any mobile browser keeps it apart from the other PDF software. After conversion from Word to PDF, hyperlinks are preserved. Merged PDF file consists of page numbers that remain same from previous files.